In the previous lesson, we looked at ‘Positioning Your Cutting Patch & Preparing Beds’. It was, I’m sure you’ll agree, pretty nailbiting stuff. 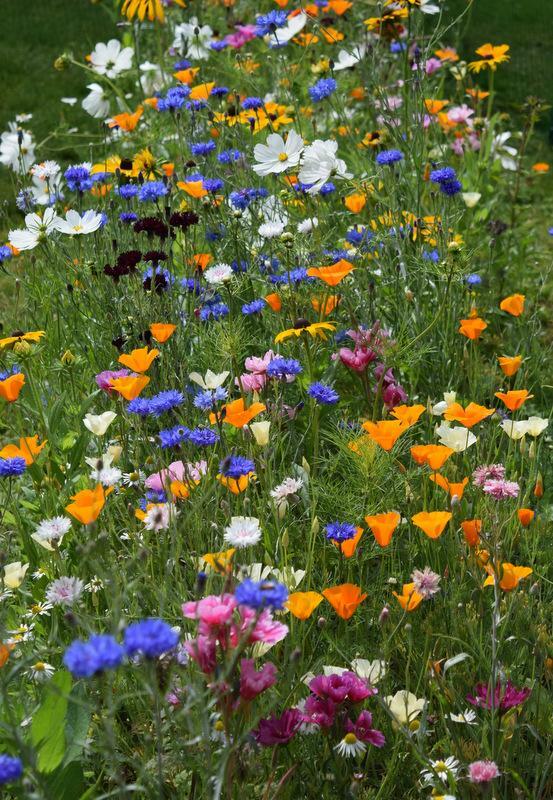 Today we will be exploring the delights of how you should go about sowing your flower seeds. I have asked the wonderful flower folk on Facebook, how they go about seed sowing. Their answers have been very varied and very useful…probably more useful than my own warblings will be. I’ll start off by giving you my own preferred method….then we will look at other people’s methods and I will explain why they are all wrong…OK OK…let me at least add comments to their suggestions. How I sow Seeds At Higgledy Garden. My method is contentious…but it works for me. 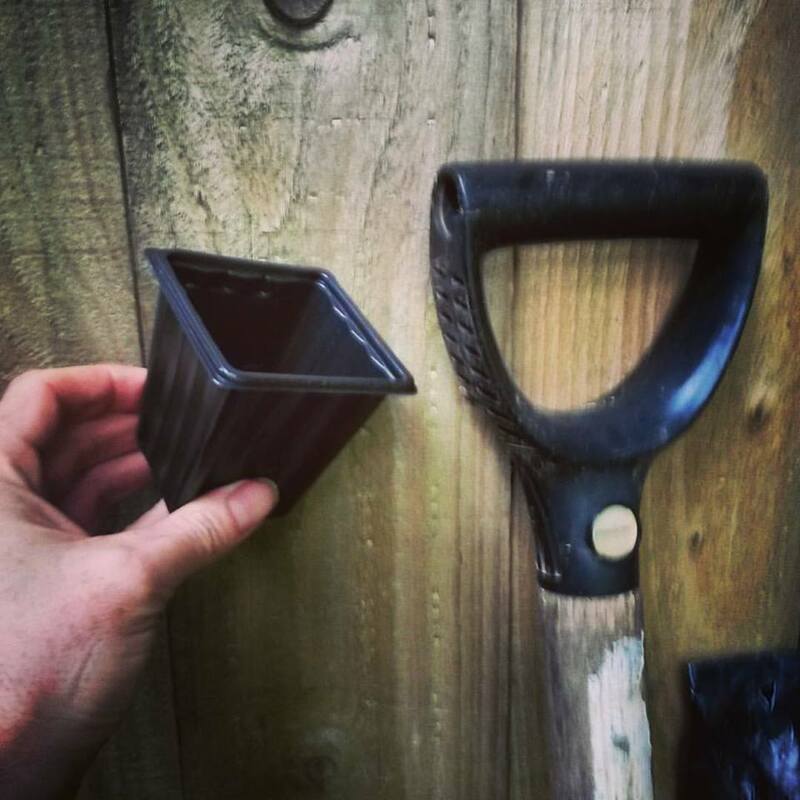 *I sow virtually everything into three-inch square pots. A seed that is sown into a three-inch pot in early April will happily develop in the pot for six weeks until it’s time to go out into the big wide world in mid-May. Or he can be kept in that pot over the winter if I was sowing in Autumn…in a greenhouse. *I use New Horizon Peat Free compost and sometimes mix in some perlite or coarse sand for better drainage. It’s not essential but it makes my neighbours think I know what I’m doing. *I sow the vast majority of my spring sown seeds in April….some in March…perhaps some Carnations in February. NB Carnations are making a comeback….well….they are in my garden anyway. I also sow a few trays in May for later flowers. In June I’ll start sowing some biennials but I’ll be writing about those beasties later in the week. Three-inch pots are your friend. Much better than cells in my opinion. 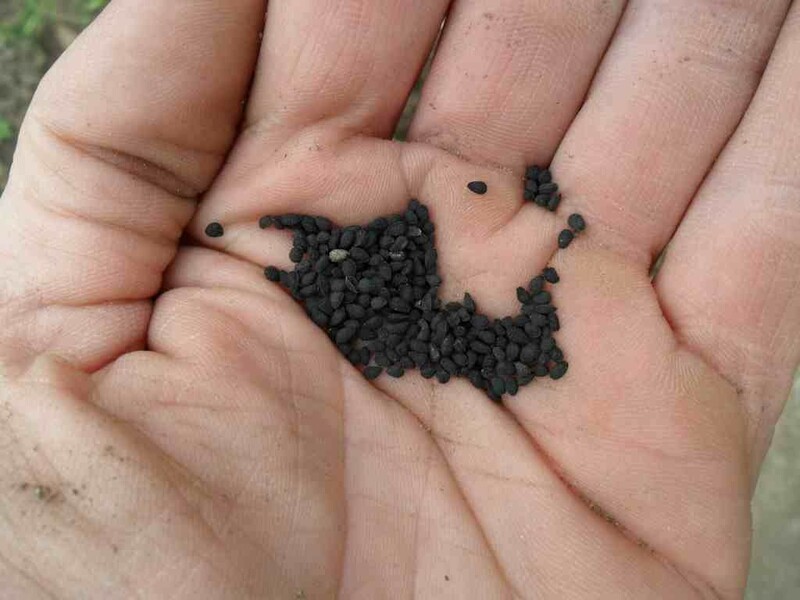 *I give my seeds a very light covering of compost or vermiculite. I buy a bag of vermiculite from the garden centre when I buy my compost. Peat free compost can sometimes develop a green mossy bloom on the surface if left damp…I find that a gentle covering of vermiculite stops this. Vermiculite is also a glittery gold colour….so it’s like bling for your seedlings. #innit. Much like the perlite…vermiculite is not necessary…but it helps…I doubt if I spend more than £10 a year on it. *OK…here’s the crunch. I never pot seedlings on. I find this whole process faffy and dull. Why start seeds off in a seed tray if you are going to later move them to a three-inch pot?…just start them in the pot. Depending on the size of the seeds, I just sow a tiny amount in each pot. Take Cosmos for example. I would sow two seeds in each pot. If two germinate I destroy one. #HarshLeader(butFair). If none germinate, I’ll simply resow. #simples. The other benefit of this method is that you don’t end up having a trillion million seedlings to pot up with nowhere to put them. Seeds sown in New Horizon Peat Free Compost. Vermiculite covering. *Nurture these seedlings…keep them warm….let them have as much light as possible and don’t let them get waterlogged…damp/dryish is much better than wet. *After the frosts I plant out…usually mid-May. *After this…the workload drops to zip all….I just gently hoe around my seedlings every few days. My 40 square meters takes just ten minutes or so. Once the seedlings become ‘plantlets’ (? )…about six inches high, I’ll add a mulch around them to keep the weeds down. This process is more time-consuming than sowing seeds straight into the ground but in fact it doesn’t take all that long. 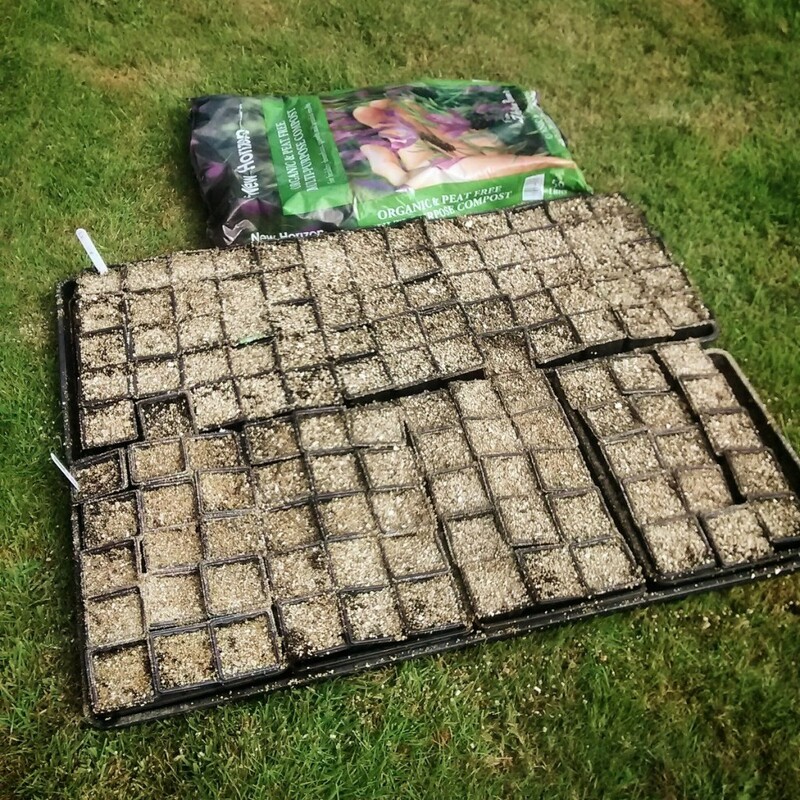 Even with a gin and tonic in one hand I can sow up 4 seed trays in less than an hour…so sowing the whole lot would be less than an afternoon. I find this takes considerably less time than weeding around tiny seedlings that were directly sown into the ground….and native weeds grow faster than our non-native flowers. HOWEVER…some growers swear by direct sowing….as we shall see. 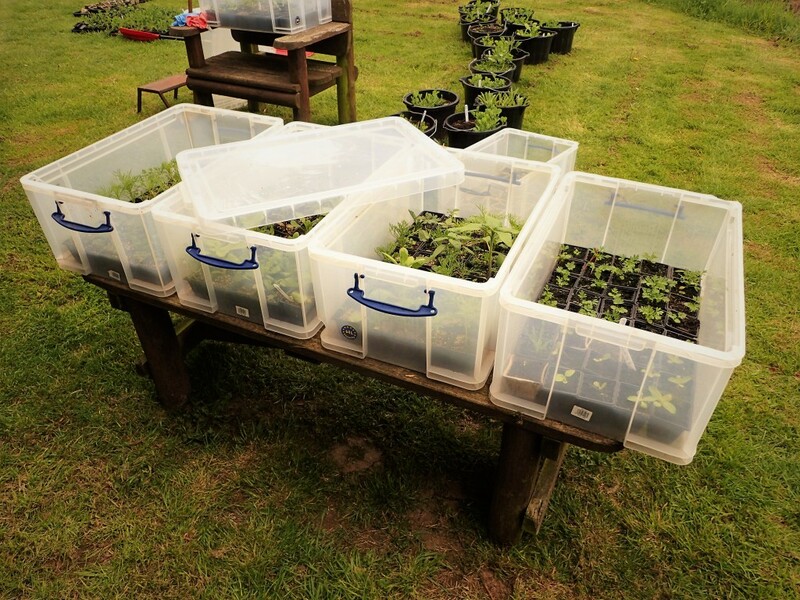 Storage boxes make amazing mini greenhouses. Here’s what my customers say….well most of them are customers….some of them are just waffs and strays. ;) Thank you all for your comments and tips. #Facebook. Lorraine Pullen Morning Ben my top tip would be don’t sow many seeds. 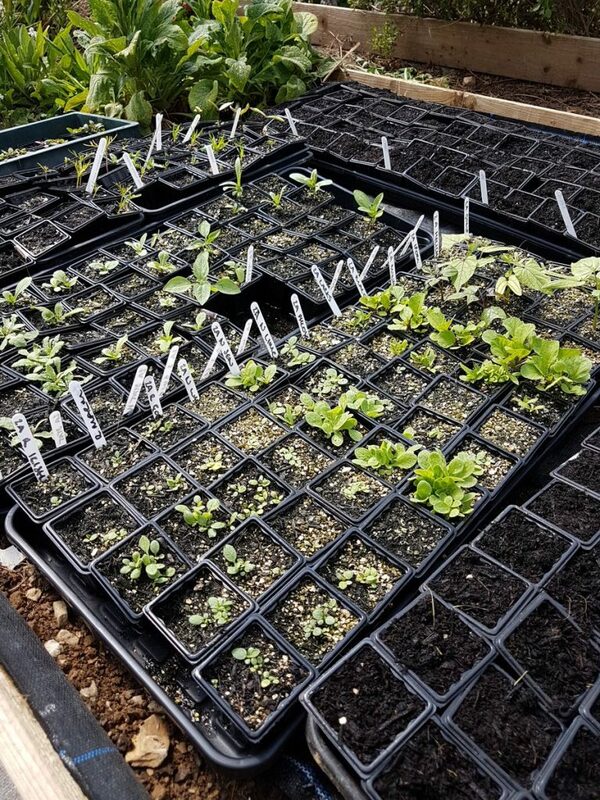 In the early days I would happily sow whole packets in a couple of trays and then spend hours pricking out hundreds of plants that I had no room for and ended up giving away. Now I sow one small pinch of seeds into a small pot or a cell of a tray and still have a few left to give away and this way I have space in my greenhouse for lots more variety. Joff Elphick When I was growing cut flowers for a boutique hotel and cookery School I sowed absolutely everything direct. It meant no one needed to water over hot weekends, there was no check in growth at pricking out or potting on and nothing ever failed. No cloches, or fleece etc was used. Zinnia, cosmos, Ammi etc etc. Basically everything you sell was down direct. Save yourself a lot of trouble and try it. There you have it…everyone has their way. Joff has grown flowers for a long time…and knows his onions….so to speak. Nicky Ogborn All my seeds get started in yoghurt pots, food trays, basically anything without holes in the bottom and put on my sunny windowsill until I prick them out (tend to pick out the biggest ones and then give up halfway through a pot as I run out of space/lose the will to live). Easiest and most resistant to pests would be antirrhinums and scabious. Gypsophila and persicaria were a bit tricksy for me this year. I have taken Persicaria out of the shop as it was too sulky for the happy vibe I want to push out. note how pricking out her seedlings gets Nicky down! Don’t do it Nicky! You have to be careful when starting seedlings on a windowsill that they get enough light…remember the light is only coming from one side. Having said I never direct sow. 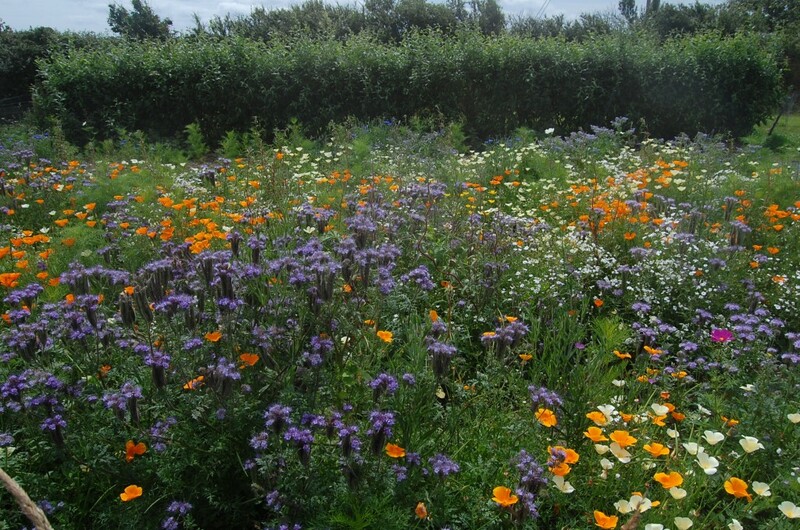 I direct sowed this allotment three years ago and it did very well…though a few of the flowers dominated the others. Hannah Roberts If you have young children don’t use plant labels use masking tape all the way round pot & write on the tape to identify seedlings. Hannah, you are a genius. Flash is a fan of label theft too. My beginning was Thrifty, determined to re use/ re cycle but that became messy..and not space efficient. 2. Also, make a list of what you are planting, I didn’t so countless googling to check whenever I found a badly labelled stray pot..
3. Make sure your labelling doesn’t wash off! Or just enjoy a lucky dip.. I like consistency and order…I am turning into my Dad. Rosie takes heaps of wonderful flower photoraphs (that I steal). Visit her page to have a look. Wildlife, as well as domestic beasts, will quickly gobble up seedlings if one isn’t careful. Karen J N Edgar Direct sowing is great fun. Don’t be afraid to give it a go. Too many – pull some out. Had great success this year by doing this. Nigella cornflowers poppies bidens all easy to grow this way. Mind you they will find their own space!. Don’t have a greenhouse. No room. Use two shelves from an old fridge to cover pots of seeds outside too until they germinate. It works. Motto – give it ago. As Karen says ‘give it a go’…I don’t want to be too prescriptive with my own method…it’s all about experimenting. PS I use storage boxes as mini greenhouse. Works a treat. Lenore Messick Don’t start seeds too early – they will sulk. Wait until the soil is good and warm if you’re going to sow direct. If you’re sowing inside (windowsill), wait until there’s plenty of light. If you can stand looking at it for weeks on end, it really works to line the windowsill under your seed flats or pots with aluminium foil – reflects the light. I have also found my cheap electric propagator to be a good investment. Yes, good point. I didn’t write much about direct sowing….but in my experience sowing outside before mid-April is counterproductive. Alison Badman Don’t be tempted to start sowing too early indoors or in the greenhouse Reading comments on other FB gardening groups so many people think a warm late winter day means spring and try to get ahead with sowing only to find they have straggly seedlings reaching for light and it’s too cold to plant out. On the other hand it’s worth do late midsummer sowings of annuals to get a continuous display into autumn. Newbies be aware of how folk have learned not to sow too early…we all know it’s tempting…but it will disapoint…and worse…by the time you’ve realised it’s gone wrong you will have missed a really good window of opportunity to sow. I know of one amazing flower grower who doesn’t sow a single seed until May. Always use top quality seeds! Jan Willetts If you have seedlings try watering with cold camomile tea, it prevents damping off disease. I make a pint with one teabag. Being a rugged, alpha male type, I haven’t got any Camomile tea….but this sounds wise. Lesley Brown on gardeners World on Friday a lady cur off a seed head (Hesperis Matronalis) and just stuck in in the ground where she wanted it to drop seeds and grow. Dysko Stu Using perlite and vermiculite in 3×3 with correct compost means you can sow fewer seeds and get greater yields. Then you don’t have to replant them. All stuff you’ve said before. The first year I didn’t do this and yields were low. Then I lost loads during repotting. Another shout out for perlite and vermiculite. NB Perlite is for mixing in with compost…vermiculite is for a top layer. Sian Price This might sound a bit woo woo but since I started doing the moon gardening thing – flower/Root/leaf days – germination rates are far better for the herbs! Seriously works. 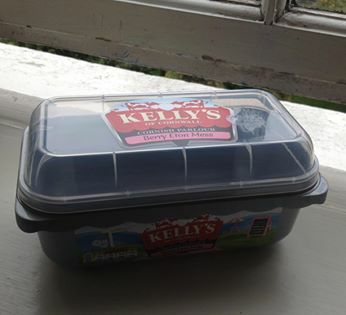 Caroline Davies Buy Kelly’s Cornish ice cream. They sell it in handy mini propagators. 3) Throw to back of border. Hope for the best. Jane Langley Write on both sides of the label as one side always fades. Carol Christie If you can, use square pots. Means you can fit more into your space. Also, if taking cuttings, put one at each corner. Rose Mckmerrell’s handywork ….a perfect Higgledy patch of annuals….splendid. Yes…square pots are the way forward. Get good sturdy ones and they will last for years. Elizabeth Jones Definitely look at quantities. About 12 of each variety is about right for me. Yes…good point…why not up that to 15 and call it a seed tray…that way with a few failures you will still have enough for a square meter. Cassie Maund-Powell Try sowing different times of year, sweet peas in autumn come early, sew again in spring for later ones, sew half hardies at monthly intervals in spring/early summer. Once you are in the swing of things, there are sowing opportunities from January to November. Right…I think we have covered most of it. 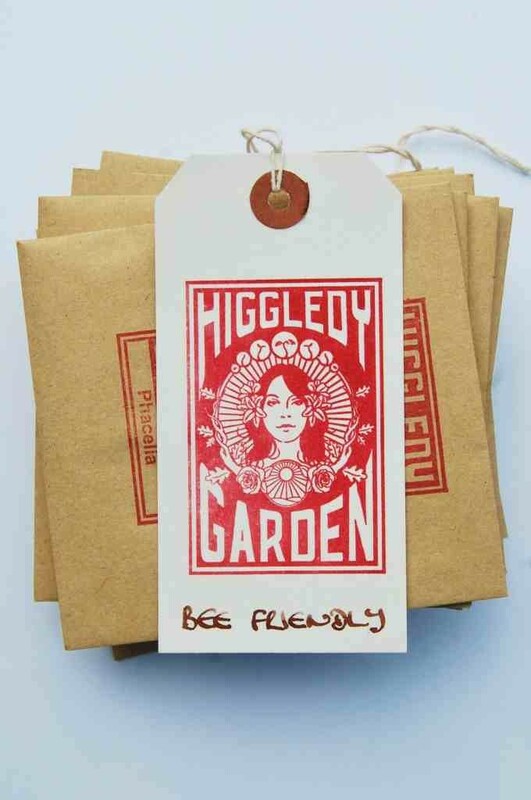 Please direct any questions to the Higgledy Garden Facebook page…I will do my best to answer them. Tomorrow we will discuss which flowers are best in a domestic cutting patch.